This site looks great!! I really love your blog, will be back again. It’s a great marketing. It’s just watermelon that happened to be placed near fried chicken. 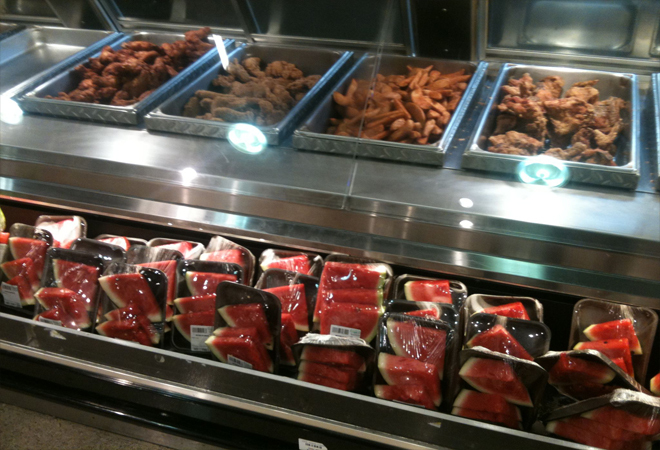 I doubt that the person who stocked this was even thinking of the “black people like watermelon and fried chicken” stereotype. These are two common picnic/summer lunch foods. People need to calm down and stop looking for chances to call “RACISM!” If you look hard enough in any store, you’ll discover something that could seem racist to someone. this site has had no updates since july……..WTF fail! This picture of Ice Cube is way funnier than chicken and watermelon. Is that a real picture? I love watermelon and fried chicken. I saw this video on http://roflcube.com and was surprised at who was recording it. I also have a funny site, can you please link back to me? Thanks.